This post has been sponsored by Campbell’s®. All thoughts and opinions are my own. 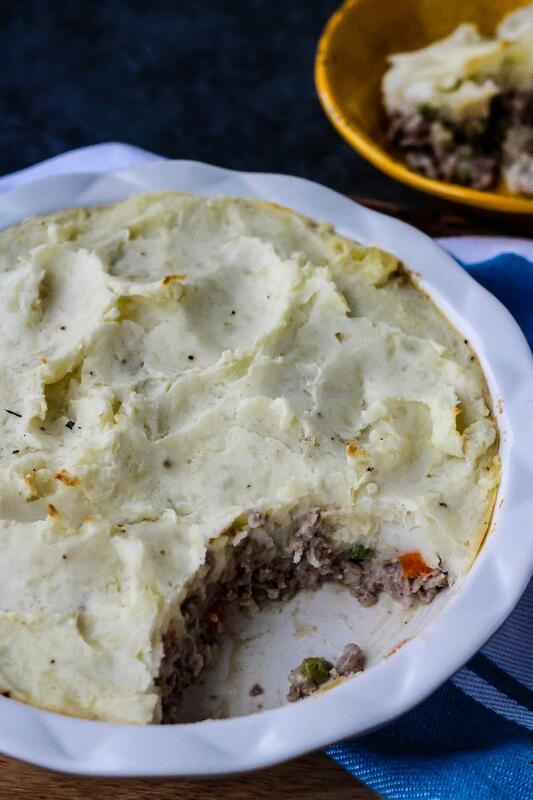 Easy Turkey Shepherd’s Pie lightens up a traditional recipe with lean ground turkey while using a few simple shortcuts to save time! Goodness gracious, it’s been cold in Kansas City. We’ve been part of the arctic blast and have had a nearly record winter in terms of snowfall and ice. For me, this means I want ALL the comfort food! When I get home at night, I look at the fridge. None of the fresh vegetables look good to me. I need potatoes—and lots of them! I made this easy Shepherd’s Pie recipe on a rushed weeknight when we all needed something warm and comforting. Looking for more comforting recipes? Check out www.CampbellsKitchen.com for more ideas! 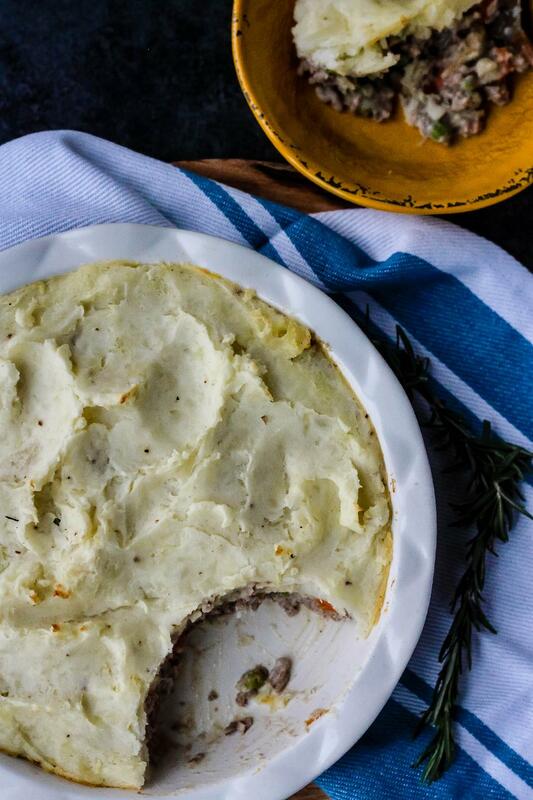 This Easy Shepherd’s Pie takes a few shortcuts, but I promise you won’t be able to tell! First, to make the gravy, I used Campbell’s® Condensed Cream of Mushroom soup! It’s such a versatile recipe starter. By adding some broth and Worcestershire sauce, you have a hearty gravy for the turkey and vegetable portion of the pie in just a few steps. My second shortcut involves a mashed potato topping. Yes, you can make them totally from scratch. But it takes a lot of time, right? I made my mashed potato topping for this Turkey Shepherd’s Pie in about 10 minutes by using pre-cubed, frozen potatoes that are steam-able in the microwave. 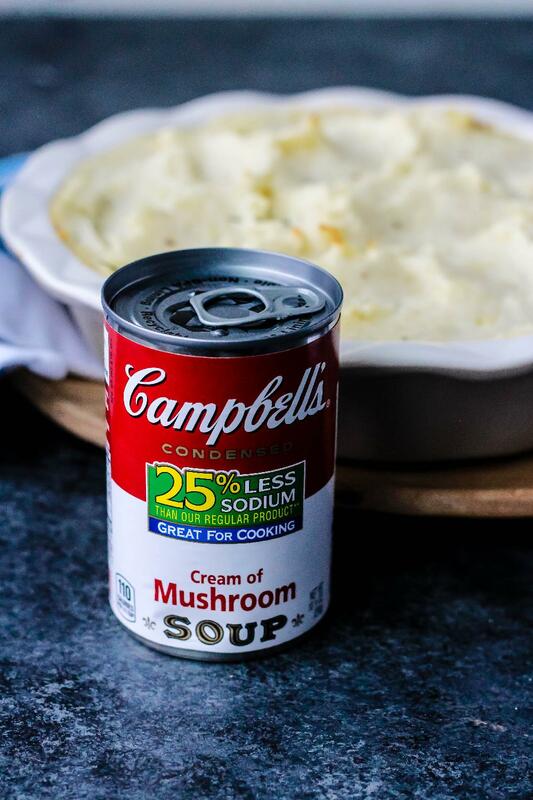 You can typically find them labeled as “Steam N’ Mash.” If you’re unable to find these, you can certainly use instant potatoes or I will provide a quick write-up on how to make mashed potatoes from scratch in the recipe below. So, between using Campbell’s Condensed Cream of Mushroom soup and my potato shortcut, I was able to save about 20 minutes of prep and cook time. 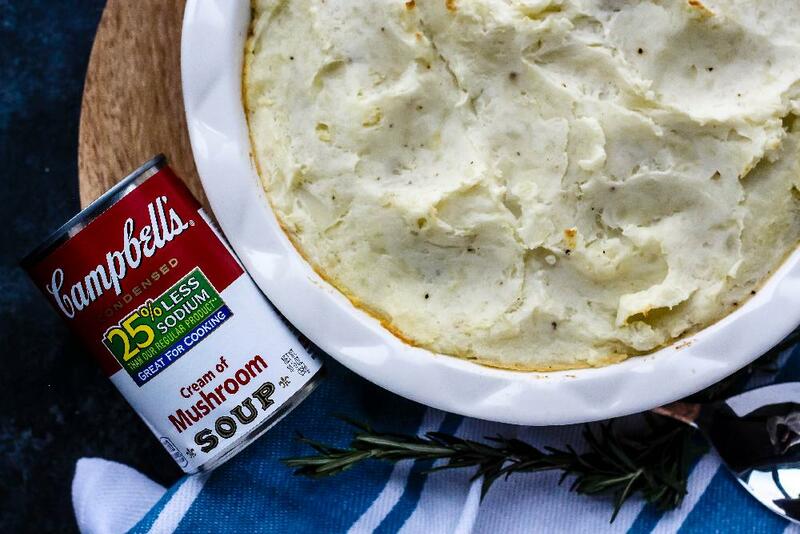 That means this Easy Turkey Shepherd’s pie is TOTALLY weeknight friendly! My family really enjoyed it, and I hope that yours does, too! In large non-stick skillet, heat the oil on medium-high heat. Add the diced onions and saute for 2-3 minutes, until they begin to soften. Add the ground turkey. Saute, chopping the meat into small pieces until cooked mostly through for about 5-6 minutes. Add the diced vegetables and stir to combine. Add a dash of salt, pepper, and garlic powder, to taste. Add soup, Worchestershire, and broth to turkey mixture, and bring up to a simmer. Stir well to combine, an additional 2-3 minutes. Transfer the turkey and vegetable mixture into the bottom of a greased pie dish or 9×9” pan. Meanwhile, microwave the potatoes per the package instructions. * Transfer cooked potatoes from package into mixing bowl. Add butter and milk, then mash with a potato masher or mixer. Taste, and add salt, pepper, and garlic powder until seasoned to your liking. Top the turkey mixture in the pie dish with the mashed potatoes, and smooth with a spoon. Bake for 20-25 minutes, until the top just begins to form a golden crust. Serve warm. *If making your mashed potatoes from scratch, peel and cube about 4 large baking potatoes. Boil in salted water for 15-20 minutes, until fork tender. Drain and mash, adding butter, milk and seasonings to taste. This is pure comfort food! Such a great way to warm up when it’s cold outside. I am totally craving this now! So hearty and delicious. One of my all time favorite recipes! Love everything about shepherd pie! This looks amazing I cannot wait to try !! This looks delicious, I can’t wait to try this! Of course! I think using cauliflower is a great idea, it does tend to be a bit more watery, but I think that the taste would still be great! I substituted lean venison burger for the turkey. It was still very good and made for a quic and easy meal. As for the potatoes, I added chives for an additional tasty zing.